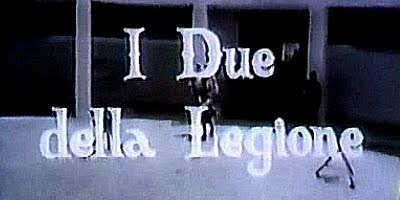 Those Two in The Legion is an early comedy from director Lucio Fulci and the first film that he led with Franco and Ciccio. Following on the heels of Abbott and Costello and Laurel and Hardy before them this is, as the title suggests, a duo in the foreign legion film and just as with Fulci's How We Cheated The Army there is a certain anti establishment feeling as idiocy confounds authority. Given that this film is from a period where speeded up film was still considered mirth inducing it is a small mercy this device was not overly used in this feature and Franco Franchi thankfully resists the temptation to gurn and grimace to the extent that he has been prone elsewhere. The film has a number of fine ideas and benefits from some strong and pretty tight writing from a team of eight writers including dear Lucio himself and the prolific Bruno Corbucci. There is an apparent nod in the direction of Some Like It Hot when our duo are forced to disguise themselves as women in a harem while on the run and highlights include some fun mirage sequences for example where our duo mistake a desert based cola salesman for an optical illusion and a ride on a camel, the ship of the desert, leads to a bout of seasickness. Rosalba Neri puts in an appearance and the soundtrack is provided by Luis Bacalov with a theme song composed by Ennio Morricone and Rosario Borelli. The writing team cannot resist one final dig at authority when our two heroes, having saved the day and presented with a medal apiece, get drummed out of the legion for not in fact being bona fide criminals.